This species is accepted, and its native range is N. & W. Borneo. Recorded from Tasek Merimbun. Elsewhere in Sabah and Sarawak. Endemic. Slender clustering rattan climbing to 30 m tall; stems without sheaths to 4-5 mm diam., with sheaths to 13 mm diam., internodes to 10 cm long. Sheaths dark green, smooth, sometimes with a few scattered spines to 4 mm; knee conspicuous; ocrea forming a low membranous ridge c. 1 mm high. 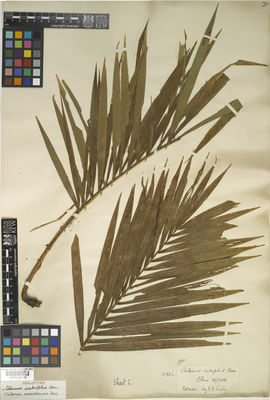 Flagellum to 1.5 m. Leaf cirrate to 70 cm including the petiole to 11 cm; petiole very sparsely armed with short lateral spines; rachis covered in sparse rusty-coloured hairs; leaflets c. 10-22 on each side of the rachis, regularly or slightly irregularly arranged, lanceolate, the longest to 18 × 1.5 cm, densely covered in minute rigid bristles on both surfaces giving the leaflets a scabrid feel. Inflorescences to 1 m, with only a small flagellum, with c. 5 strongly curved partial inflorescences bearing strongly curved rachillae; rachillae bearing conspicuous cups of bracteoles and rather distant flowers; female rachillae to 3.5 cm. Almost mature fruit elongate, c. 13 × 6 mm, tipped with a beak to 1 × 1 mm, and covered in 15 vertical rows of pale brown scales with dark tips. Seed fusiform with disgustingly sour and foetid sarcotesta; endosperm homogeneous. 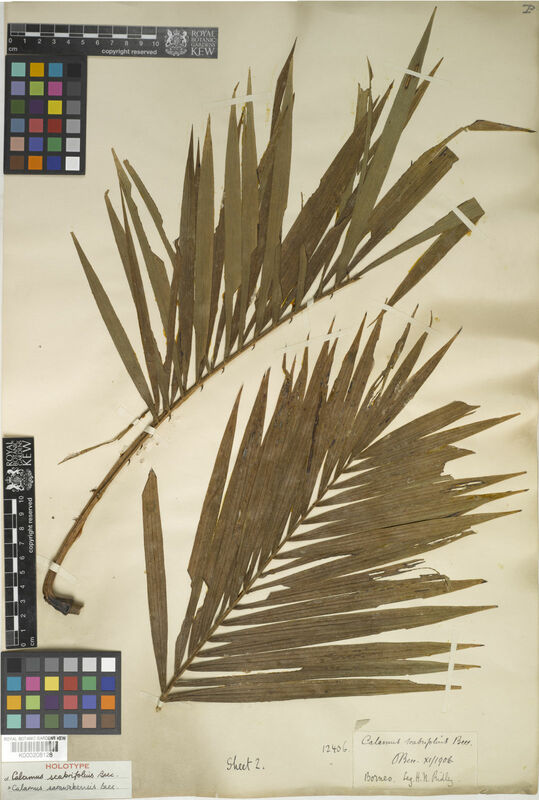 Seedling leaf pinnate with c. 5 hairy leaflets on each side of the rachis. A good slender cane used for binding.